Crisp and refreshing, lettuce might be your first choice for a refreshing and healthy light lunch. It is also a nutritious juicing ingredient. 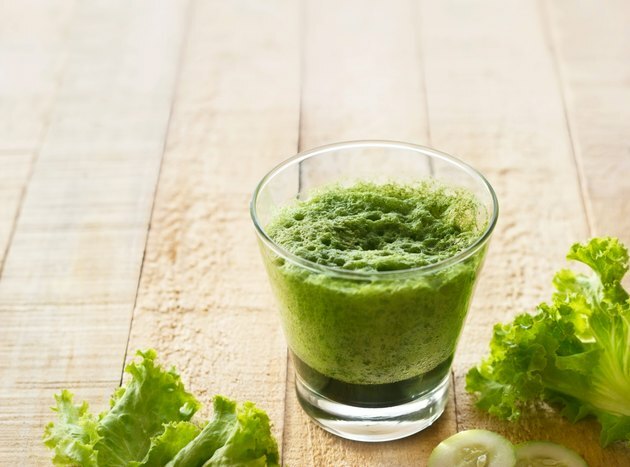 While unconventional, juicing lettuce gives you access to the many nutrients in this leafy green, and with its mild flavor, adding it to your favorite fruit or vegetable juice will boost the nutritional content without vastly changing the taste. It takes 300 grams of lettuce to produce 1 cup of fresh lettuce juice. This is a little under 11 cups of fresh, shredded lettuce. Also known as vitamin B1, thiamine is a member of the vitamin B complex. It helps your body maintain healthy skin, hair, eyes and liver, and provides support to the nervous system. With 0.192 milligrams of thiamine per 1-cup serving, fresh lettuce juice has almost 17.5 percent of the recommended dietary allowance for adult women, 16 percent of the RDA for adult men, and almost 14 percent of the RDA for pregnant and breastfeeding women. Vitamin A is a natural antioxidant that protects your body's cells from damage from free radicals and environmental toxins. Toxins and free radicals contribute to the aging process, and make you more susceptible to heart disease and cancer. Vitamin A also helps your cells reproduce and helps maintain good vision. A 1-cup serving of fresh lettuce juice has 1,125 micrograms of vitamin A. This is over 100 percent of the dietary intake for all adults, except breastfeeding women, where this amount provides 86.5 of the recommended dietary intake. Potassium is an essential mineral that, in addition to functioning as an electrolyte, helps regulate the acid-base balance in your body. It also builds muscle and proteins. Along with its role in breaking down carbohydrates and helping your body use them as energy, potassium helps maintain regular, healthy body growth. 1-cup serving of fresh lettuce juice contains 561 milligrams of potassium. This is almost 12 percent of the recommended dietary intake for all adults. Present in all bodily cells, phosphorous makes up 1 percent of any person's total body weight, with the majority of it residing in your bones and teeth. Phosphorous helps produce healthy bones and teeth, aids in the breakdown and use of carbohydrates and fats, and helps produce protein. With 84 milligrams of phosphorous per 1-cup serving, lettuce juice provides 12 percent of the recommended dietary intake for adults.